Sharjah: Australia’s batting power was in full display in the first One-day match of the five match series against Pakistan at the Sharjah Cricket Stadium. They transformed Pakistan’s impressive total of 280 for 5 in 50 overs, carved out of Haris Sohail’s maiden unbeaten century, into an easy one and recorded an eight-wicket win. Riding on the confidence of having conquered India in India in a One-day series, Australians have announced that they have carried their winning form India into UAE. 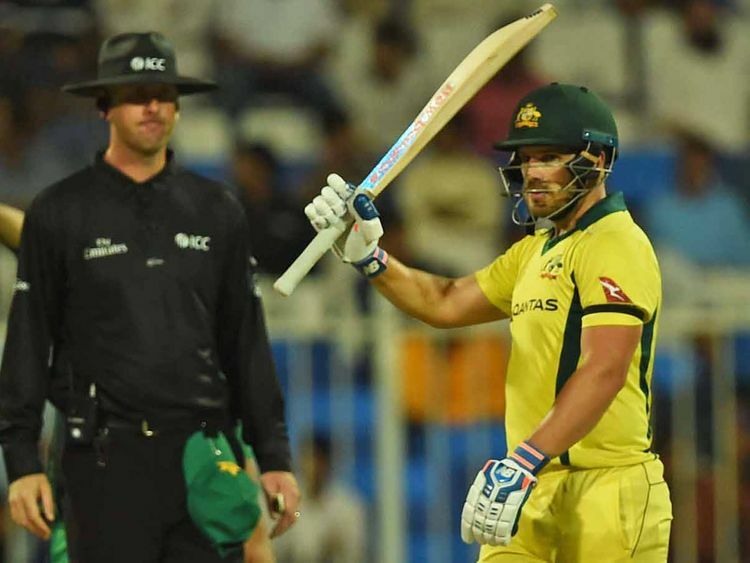 Australian skipper Aaron Finch led from the front through a knock of 116 runs off 135 balls with eight boundaries and four sixes. He was involved in two partnerships. First, Finch put on 63 runs in 11.1 overs with opener Usman Khawaja (28) and then went on to register a mammoth 172 runs partnership with Shaun Marsh. It was Finch’s 12th ODI century. So methodical was their chase that in the last 15 overs they needed only 93 runs and the Australians reached the target with six balls to spare. After Finch fell, edging debutant Mohammad Abbas to wicketkeeper, Marsh, who played second fiddle to Finch, steered Australia to the target through an unbeaten 91off 102 with four boundaries and two sixes. Peter Handscomb chipped in with an unbeaten 30 runs and put on an unconquered 46 runs in the last 6.3 overs. Earlier, Pakistan had won the toss and elected to bat. Sohail hit an unconquered 101 runs off 115 balls with six boundaries and a six. Umar Akmal, returning to the ODI squad after January 26, 2017, hit 48 runs off 50 balls with three sixers and put on 98 runs in 18.2 overs with Sohail. Towards the end Faheem Ashraf (29) and Imad Wasim (28n.o) boosted Pakistan’s total. Opener and debutant Shan Masood, impressed everyone with a stylish 40 runs off 62 balls. Imam Ul Haq, who has established himself as a fine opener, stepped out and hit Nathan Coulter-Nile for a straight six in the fourth over. Masood began fluently by hitting Jhye Richardson for two consecutive boundaries in the fifth over. The first was an elegant square drive and next a well-timed pull. He also pulled the last ball of that over for another boundary. Haq also pulled Coulter-Nile for another boundary and Pakistan were off to a breezy start. The opening pair put on 35 runs in 8.4 overs when off spinner Nathan Lyon ended the partnership by having Haq out for 17 with a tossed up delivery that forced Haq to bit back into the bowler’s hand. Sohail joined Masood and both the left-handers kept the score board moving picking the gaps elegantly. Leg spinner Adam Zampa did occasionally beat the batsmen with his turn but failed to get their wicket. Masood, who grew in confidence, hit Lyon over mid-off for another boundary. The pair put on 43 runs in 10.1 overs when Coulter-Nile forced Mashood play on to his wicket while attempting a pull. Akmal and Sohail steered Pakistan past the 100 run mark in the 23rd over. At the score on 110 for 2, Akmal on 13 escaped being caught by Peter Handscomb at deep cover off Lyon as Handscomb failed to hold on to the miscued shot. Akmal celebrated his lucky escape by hitting Richardson for two successive sixes . He also hit the last ball of that over for another six over long on. Pakistan went past the 150 run mark in the 32nd over. Akmal fell two short of his half century lifting Coulter-Nile to Finch at mid-off. It was a good come back knock from Akmal . Skipper Shoaib Malek walked in with only 12 more overs to go. He hit Maxwell for a boundary and a six but got bowled to the last ball of that over for 11. Faheem Ashraf played some nice drives especially a cut shot behind point off Maxwell. Sohail moved on to his nineties through an edged short to third man. Ashraf too utilized the gap in the slips to get some runs. Ashraf on 29 got caught by Marcus Stonis at backward point off Richardson. The teams observed a minute’s silence for the tragedy that occurred in Christchurch, New Zealand, seven days ago before the start of the match.